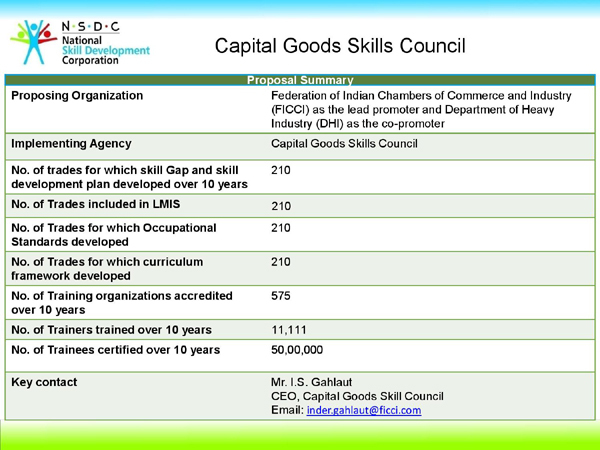 Capital Goods Skill Council (CGSC) is a Not-for-Profit Organization, registered under the Societies Registration Act, 1860. The Council has been promoted by Federation of Indian Chambers of Commerce and Industry (FICCI) and Department of Heavy industries (DHI), Government of India, with financial support by National Skill Development Corporation (NSDC). The supporting organizations include leading industry and industry associations representing both public and private sector. The Capital Goods Skill Council is a unique initiative to play proactive role and bridge the gap by creating a vibrant eco-system for quality training and skill development for the Capital Goods sector.